The pastel settees, billowing white curtains and crystalline lamps combined with the unfinished walls, exposed beam ceiling and assorted period knick-knacks create a scene straight out of a Fitzgerald novel — you’d almost expect to see Daisy leaning over to get a light from Gatsby in the corner. “Evanston” and “college town” have never been synonymous. The city is regarded as one of the birthplaces of prohibition, and was a dry town until 1972. There hasn’t been a ban on liquor in over 40 years, but with the death of The Keg of Evanston not long before our time and the tragic loss of Tommy Nevin’s just a few months ago, it can sometimes feel like Frances Willard and her Woman’s Christian Temperance Union still have a vice-like grip on good old E-Town. Luckily, there’s a new hidden speakeasy in town whose secret location should allow it to evade the hawk-like eyes of the alcohol intolerant. Sure, the giant sign out front proudly advertising “Bourbon N’ Brass” may not exactly scream “underground joint,” but, once inside the building, it is surprisingly hard to find. Visitors to this 1920s-themed joint — part of the new “Evanston Rocks” complex at 1012 Church St. — will have to find and go through the secret bookcase on the second floor to get their sweet liquor fix. 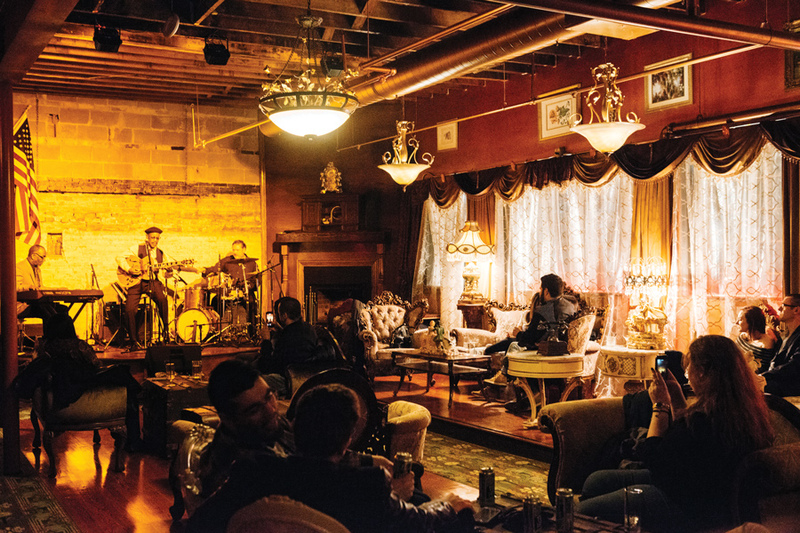 Inside, the intimate space is a warm, eclectic blend of 20s decadence and grandmother’s attic. The pastel settees, billowing white curtains and crystalline lamps combined with the unfinished walls, exposed beam ceiling and assorted period knick-knacks create a scene straight out of a Fitzgerald novel — you’d almost expect to see Daisy leaning over to get a light from Gatsby in the corner. Instead, the room is incongruously filled with modern-clad individuals with an array of glowing technological devices. The crowd is predominantly yuppie; the vibe is more cocktail and conversation than brawling and boozy. The price of drinks might be a factor in the older draw, as most cocktails are around $12. From what I sampled, the cocktails err toward the sweet side. The “Rockin’ Rye” had mostly pineapple and orange flavors with just a hint of the bitter rye and an interesting cinnamon aftertaste. The “Bee’s Knees” had a juicy strawberry taste with a pleasantly surprising tart and limey finish. Don’t mistake the sweetness of these drinks as a mark of being stingy with the booze, though: I was feeling a happy glow halfway through the first drink, and was bobbing my head to the music a little too passionately after finishing the whole thing. I felt better that I didn’t seem to be the only freak in the joint feeling the music a little too much, as many other sloshy patrons were grooving to the beat of the live band as well. The jazz trio played a tasteful mix of standards and funkier modern selections, providing the perfect backdrop to any patron’s foray into the flapper lifestyle. Will this reincarnate the Nevin’s vibe as the next Thursday night college bar? No, not even close. But does it have the potential to be an eclectic new venue for students to enjoy live music and a laid-back drink without having to take the Red Line? Absolutely. Read more from April’s edition of The Monthly here.